Back in 1988 when I first came to Japan for a vacation and to meet my future husband, I went to Tokyo Disneyland. Though it is a very popular destination with the natives, my husband and I weren't really drawn to it over the years. However, with our departure at the end of March, we decided it was time to put the other bookend on the story of our life in Japan and make a return trip. Twenty-four years later, we showed up at the gate to the Japanese incarnation of Disneyland. The food offerings were actually disappointing and sparse. Most of the snacks were repeated at every gift shop on the grounds. 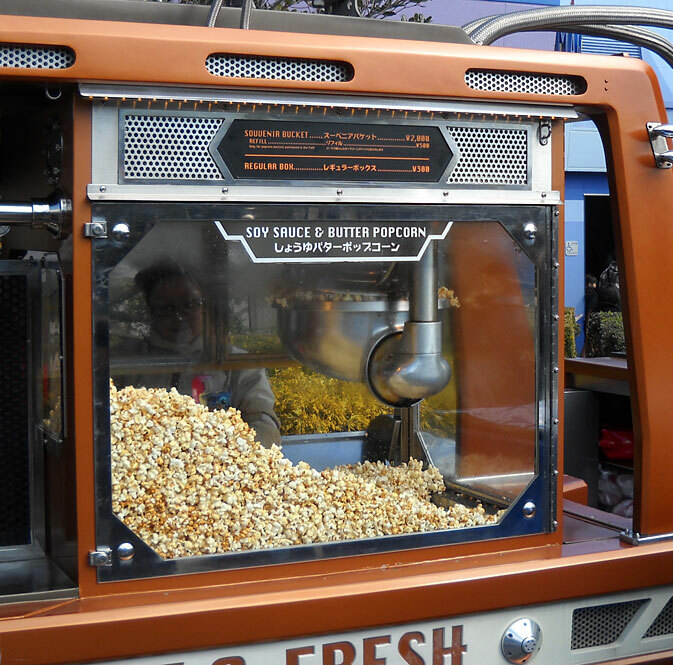 One thing which was relatively common was fresh popcorn. Each vendor sold a different flavor and this was one of the more uniquely Japanese ones. I'm sure I won't be seeing soy sauce and butter popcorn at amusement parks back home. I'm not sure what to make of the "adult" line of KitKats in Japan. When I ask my Magic 8 Ball about whether or not it is popular, it's saying that all signs point to "yes". In addition to the original less sweet semi-sweet release, there is currently a white chocolate and green tea version. On the other hand, I keep seeing this particular KitKat stacked in huge boxes and for a reduced price. Shortly after my husband and I paid full price (100 yen/$1.25) for this bar, I found it on sale for a mere 59 yen at Okashi no Machioka discount snack shop. I had seen the original version available for the same price not too long ago and I figure that the market must be flooded for it to show up in such a proverbial bargain bin. However, if it's not popular, why does Nestle Japan expand the line? For white chocolate in particular, I'm quite pleased at the development of an reduced sweetness version as it tends to run on the cloyingly sweet side normally. I'm hoping that scaling back the sweetness will mean good things for the likes of me, though I honestly was not the one who chose this bar. It was my husband's choice. These days, he wears the pants in the family when it comes to buying KitKats. Normally, for big life purchases, we both have one leg in those pants, but I'm willing to defer to his wishes when it comes to consumer confectionary. The main difference between this and the standard white chocolate KitKat offerings is that the filling is dark in color. I believe it is filled with finely crushed bitter chocolate cookies (like the dark portion of an Oreo cookie) rather than a super thin layer of cream, or at least that such cookies are mixed with the cream. This smells like standard white chocolate, which is to say like frosting and sugar. 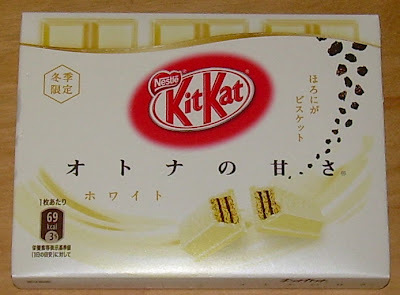 The first bite seems quite sweet initially, but then the filling mellows it out a bit and provides a flatter experience that mellows out the white chocolate. Overall, the mixture is far more palatable than plain most white chocolate offerings, but it lacks any serious depth of flavor. 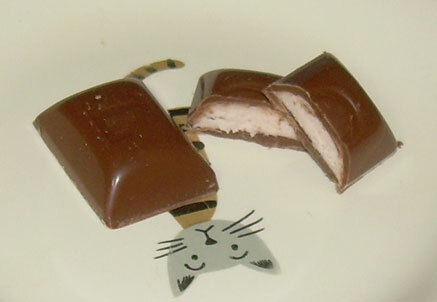 Still, as a KitKat with all of its textural delights, the balance is quite pleasant. I would have liked this a bit better if there was some more profound bitterness to the interior of the bar, but I really have no complaints. That being said, I definitely wouldn't take this over a kinako or plain milk chocolate big bar, or even a regular milk chocolate KitKat. It's good, but not great. Note that this is a box of 3 mini bars of 69 calories each rather than two packages with longer fingers of around 100 calories. 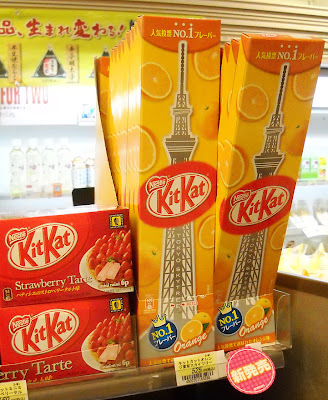 This new format is increasingly common for the standard KitKat in Japan and likely caters to the smaller snacking habits of Japanese consumers. When my husband and I decided to leave Japan, my focus on food reviewing changed. Not only do I expect to cram in more reviews of fresh food before it completely drops off my radar, but there are certain "staples" which I thought I should review and would get around to one day whose time has come. The time had definitely come to sample these nearly infamous "meat" caramels. Like many strange foods, these hail from Hokkaido in Northern Japan. I don't know if we're supposed to believe rampaging hordes of Mongolian warriors once trampled their way through leaving behind lumps of sweetened meat sweets or if this is a reference to a particular food in Japan. This is a country which calls an "all you can eat" buffet "Viking", after all. They do seem to have a thing about warrior groups and their food. Since I am not a particularly big meat fan (these are supposed to be based on lamb curry), I faced this with some trepidation. Of course, even if I was the sort of person likely to tuck into a bit of sheep flesh, I'm not sure having it in caramel form would light my fire. This is a truly strange concept, but most cultures have their oddities in this regard. America has a garlic festival in which garlic ice cream is on offer. Garlic ice cream is eminently more practical than meat candy, however. If you're a woman who has suffered a back break from your vampire boyfriend and you don't want him to come around, you can console yourself and ward him away with said cool, creamy sweet. I've written a lot of descriptions of many flavors and it's always somewhat challenging to convey in words what occurs on the tongue. This one is one of the harder ones to really describe since any mention of meat or meat flavors is likely to incite the concurrent smell and textural aspects in the sensory memories of the reader. One thing you do realize when you try a lot of faux items, like cheesecake yogurt, is that the texture plays a huge role in how you enjoy something. In the case of this caramel, it is less offensive for not being saddled with meat aspects aside from a certain savory note. Sugar on meat is disgusting, but a caramel flavored with meat flavorings doesn't have to be quite so gross. Honestly, this was pretty good. 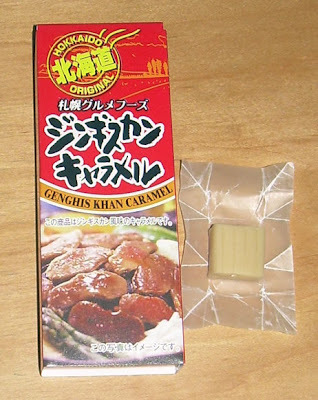 It mainly tasted like caramel with a bit of the flavor of the part of a piece of meat that is caramelized with cooking. You know, the little bits which get just a bit burnt near the edges and carry a certain chargrilled meat flavor? Dilute that by at least 70% and that's what this has going for it with just a hint of meatiness. While this absolutely was not disgusting or bad, it's really not my cup of tea either. A snack doesn't have to be bad for me to be indifferent to it. It just has to not be to my tastes. As a novelty and particularly as a "weird" food souvenir that won't totally gross people out, this is a great little snack, but as a repeat eat, it's not going to make it into my rotation. Donkey's years ago... actually, I don't know what a donkey's year is, but it was actually three years ago, I reviewed Fujiya's Peach Nectar beverage. It was delicious and I deemed it worthy of being called "nectar". Because the drink was so tasty, I was delighted to discover that there is a current "explosion"... okay, more of a tiny blast... of treats fusing the drink's sensibilities with their own. One of them is Country Ma'am cookies and another is this Look chocolate. I've not had the greatest experiences with that line of cookies so I'll either skip them or leave them for later review, but I was very keen on this chocolate... okay, not actually "very keen." The truth is that I have some reservations about fruit and chocolate mixes. It's not that they can't be good, but more the case that they can easily go wrong. One of the things about Look is that it seems to either go very well or to be completely unimpressive. The verdict on this is that things "went pretty well". 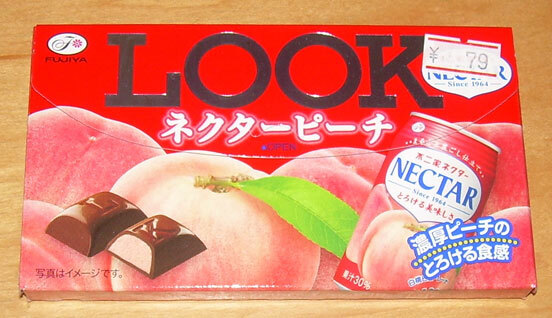 The filling is soft and has an excellent texture and has some pretty intense peach notes. It's more like a puree than a peach-flavored cream, though it is delightfully creamy and light in texture. There's a bit of a citric acid bite to it, but not so much as to spoil the sweetness or chocolate flavor. It's a much nicer consumer level release than I would have expected, though I think it helps that it is extremely fresh. I think the texture may suffer as the candy ages. All of that being said, I can imagine this may not be to everyone's tastes despite the high quality feel of the flavors. Peach and chocolate aren't as natural a pairing as orange, lemon or banana. If you are a fan of the Nectar drink or the idea of peaches with chocolate doesn't strike you as odd, I'd definitely say give this a try. Keep in mind that the fruit flavor is not muted so you'll have to deal with stronger flavors. Currently, these are on offer everywhere I go from supermarkets to discount shops to convenience stores. I paid only 79 yen ($1.00) for mine at Okashi no Marche snack shop, but a more usual price is 100 yen ($1.27). Chances are they won't be around for more than 4 months or so and probably will not make a return to the market in the near future (if ever). Personally, I liked this quite a bit, but it's definitely something I'd only consume occasionally. Given the choice, I'd always choose a real peach and after that, the Fujiya Peach Nectar drink. This is more of a palate challenger and I'd tend for pure chocolate over something like this, but it was certainly enjoyable and I in no way regret buying a box. As I approach the end of my time living in Japan, my readers may find that I will be turning more to fresh food instead of packaged snacks. That's because I view the coming weeks as my last opportunity to easily purchase such things. Once I go back to the U.S., I will probably have opportunities to buy shelf stable items like Pocky, sembei (rice crackers), and Tirol chocolates, but not refrigerated items. It's a dimension of experiencing Japan that I'm certain I will sorely miss when I'm gone. So, I hope my readers will be tolerant of and patient with seeing a few more reviews than usual of the types of things they may not find unless they're walking the same streets as I currently am. Of course, whether my readers like it or not, it's highly unlikely that I'd resist trying cheesecake. There are a great many things which I find hard to resist, and the prospect of anything made with cream cheese and cheesecake in particular is going to get my motor revving. On top of that, this is sold by Shigezo, purveyor of "healthy" food based largely on soy beans. After what I said about Japanese food not being as healthy as anyone thinks it is, it may seem odd that I'm buying into that idea, but I'll say that I believe this is wishful thinking on my part. I want this cheesecake to be healthier than the normal stuff so I can feel better about eating it. I only subscribe to the illusion when it suits my fancy. As someone who isn't a fan of tempura, but is a fan of cheesecake, I'm applying selective reasoning here. Indulge me, won't you? The Shigezo page for this cheesecake is helping me along with my illusions by failing to provide much in the way of nutritional data. 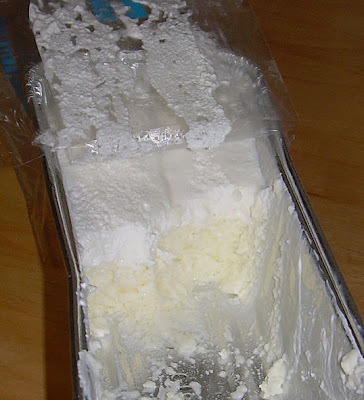 They do say that this is made with cream cheese, milk, cream, soy milk, sugar, egg white, gelatin and lemon. The claim is that the use of soy milk reduces the overall caloric value and enhances the nutrition. Since there are no calorie counts given, I'll take their word for it, because, as Fox Mulder says, "I want to believe." Depending on how you conceptualize "cheesecake" this may disappoint. There is no crust and it is certainly lacking in "heft". Even for a Japanese cheesecake, this is super light and airy. My husband called it more of a "mousse" than cake, and felt that the taste was so mild that it tasted like nothing to him. My taste buds were rather more sensitive to its delights. I could detect cream cheese, soy milk, very mild sweetness, and the ever so slightest hint of lemon. The main drawing point for me with this was the texture. It was very fatty and rich on the tongue, but so light that it melts rapidly in your mouth. I liked this a lot. In fact, I ate the whole container at once and had to skip lunch. It was a very bad idea as I felt bloated, but I can't say I really regretted doing it just once. I'm sure, however, that it's not actually "healthy", despite the inclusion of soy milk and the lack of heft and sugary overload. It's not a very big container, mind you, but I think more appropriate servings would be three moderate portions and two somewhat large ones. That being said, I'm not sure fans of "real" cheesecake would be quite so keen. I love light, fluffy, fatty things which resemble whipped cream, so this was the bee's knees for me. Your mileage may vary. Click to see a larger image with more detail. I'm going to admit that one of my enduring pet peeves in Japan is listening to Japanese people prattle on about how "healthy" Japanese food is. The truth is that they are talking about theoretical diets, not the real diets that most people are eating unless you think noodles in salty broth with fat floating around in it and bits of pork (ramen), white bread, deep fried and breaded food (tempura, pork cutlets, croquettes), pasta, and pizza coupled along with copious amounts of white rice and alcoholic beverages and a dearth of fresh fruit "healthy". I'm not saying Japanese people don't eat a sufficient balance of healthy food to be the longest lived people in the world (at least in some areas), but just that they are hardly the paragons of food virtue that people (both foreign and Japanese) believe they are. The main virtue in my experience, is very good portion control. Eating a little seems to be more important than eating "perfectly" or even "well". 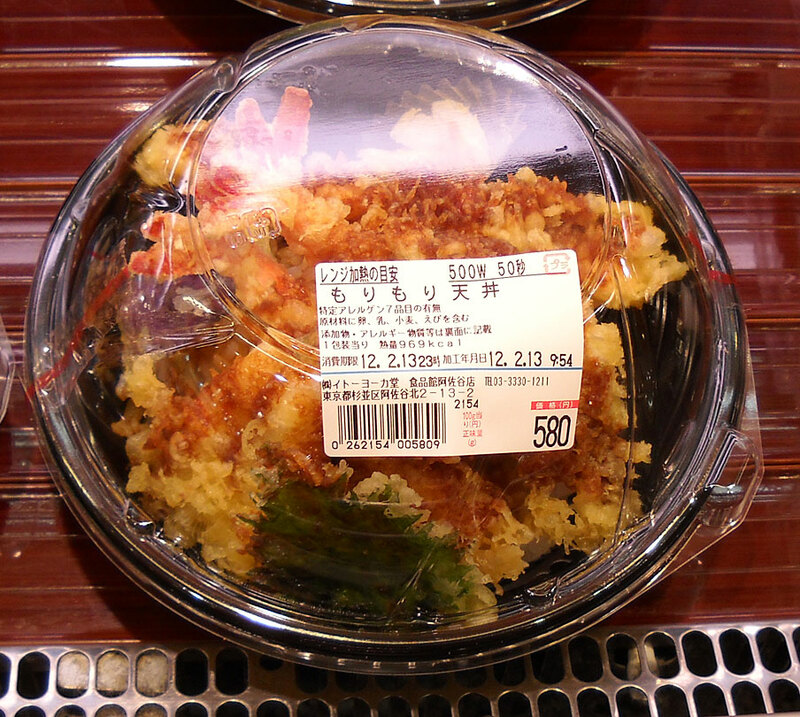 I was strolling through the deli section of Ito Yokado supermarket and looking at the options on hand when this bowl of shrimp tempura caught my eye. 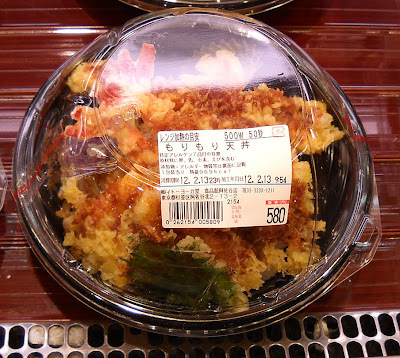 One reason why this particular market is more interesting than most is that they put calorie values on the food and this moderate sized bowl of shrimp tempura over rice with pickles packs a whopping 969 calories. I've talked to students before and they insist tempura isn't unhealthy because it's cooked at high temperatures. I remain dubious, especially after seeing things like this for sale. First things first, I did not go to the Tokyo Sky Tree. I'm not especially interested in large quasi-phallic structures or radio towers. However, one can get Sky Tree souvenirs in a lot of adjacent locations including Ryogoku, home of sumo and the Japanese National Stadium (kokugikan) and Asakusa, home of a million tacky souvenirs for tourists. I picked this up in neither of those places. There's a particular branch of New Days convenience stores in Shinjuku which carries a lot of regional sweets for some reason and this was perched on a top shelf, towering above all others. The truth is that I didn't choose to buy this. It was 525 yen ($6.76) and I knew that was going to be a premium price. It's very often the case in Japan that you purchase something in a large box and find that the contents in no way reflect the box size. I'm not talking about "contents may have settled", but simply packaging inside of packaging which is smaller. In the case of this box, one might expect a neat row of a multitude of minis, but it's just three boxes of regular KitKats. 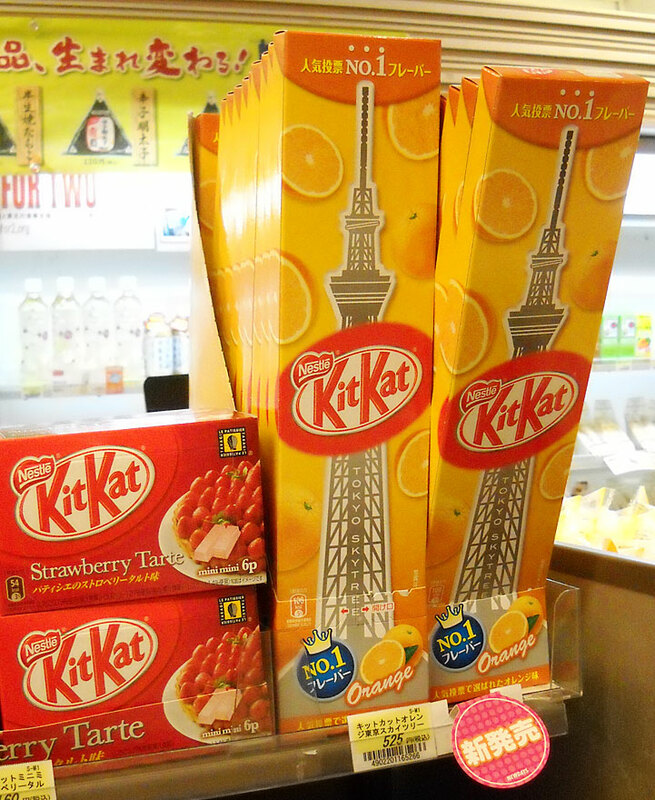 Since the average price of a regular KitKat is 100-120 yen, that means I'd pay about 360 yen for the same quantity if it didn't come in a Sky Tree box. The odd thing about this is that the box says across the top that this is the "#1 flavor" and is very popular. 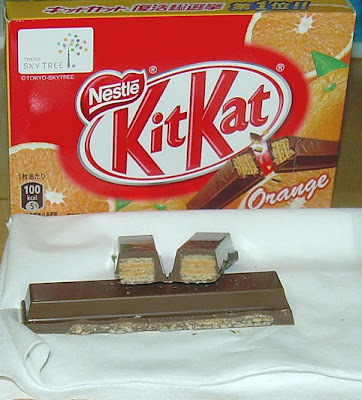 While I can see how orange chocolate would be quite popular, I have to wonder why there are constant iterations of strawberry KitKats if orange is the "#1". You'd think they'd spin out more orange versions. I question your authenticity, Nestle Japan, and the veracity of your claims. And while I'm at it, I may also question your parentage, pedigree, and the stuff you've written on your résumé. I'm also dubious of your claims of virginity, but that's not something I'm prepared to investigate more closely. This smells like fake orange flavoring, though not in a bad way. It's not like baby aspirin orange, but more like orange Tootsie Roll Orange. The bars are milk chocolate based and the orange flavoring tends to hit second after the chocolate. It comes across at first as a burst of an orange juice flavor, but quickly tapers away into the aforementioned fake orange flavor. Since this is a KitKat, it's got all of the same fresh, crispy wafer goodness you can expect from any reasonably good KitKat. This was nice enough, but it isn't what I'd call incredibly "more-ish". I wouldn't have purchased three of these for sure, but I also not have regretted having one on hand for sampling. As a novelty, or for someone who really loves orange chocolates even when they're not the most realistic in flavoring, this is pretty good. I enjoyed it enough to eat what I've got (slowly), but I wouldn't buy it again. There's no picture of the soy milk poured in a glass because it's just off-white liquid. You're not missing much. Kikkoman is one of a few Japanese brands which is very familiar to most Americans, even those who are younger than the current crop of anime-watching, Pocky-crunching, Hi-Chew chewing Japanophiles. The reason for this is that Kikkoman's soy sauce was a staple featured product on game shows since the 70's. I remember watching "The Price Is Right" and having people guess the cost of a bottle of their sauce. I also remember their products being offered as "parting gifts" to losers on a variety of game shows. When it comes to brand name recognition, I'm guessing no Japanese product would cross demographic lines like Kikkoman does. That being said, I never really paid attention to their other products, not even in Japan. Until I looked at the manufacturer of this soy milk, it didn't know Kikkoman made it. It's not that it even matters and it surely makes sense that a soy sauce maker would make soy milk as well, but mentally my brain isn't capable of lumping "black, salty sauce maker" with "white sweet milk maker". My brain has some issues, as I'm sure readers who catch my typed brain farts can attest to. As I've mentioned before, I like soy milk just fine, but it has a lot of fat and sugar in it (at least in Japan) and is more expensive than cow's milk. It took this very unusual flavor to get me to pop for my own carton of soy milk. I found this 200 ml. (1 cup) serving at Seiyu supermarket for 100 yen ($1.31). It mentions tasting like mont blanc cake, my favorite cake in all of the known universe. It's usually sold as a sponge cake with whipped cream and a pile of sweetened chestnut cream piped on top of it. I guess one might consider this a nutritious dessert drink, but there are a lot of additives in it including acacia gum, sorbitol, and dextrin. Sugar is also the second ingredient. It should be no surprise that this is quite sweet considering the ingredient list. The flavor is intense at first, but mellows out as you drink more. It really does taste a lot like mont blanc, but without the accompanying textures and varying flavors (whipped cream, sponge cake), it feels "wrong". It's like eating the topping off the mont blanc cake without the satisfying texture. And, of course, it's hardly exactly the same since it also tastes like soy milk. That's not a bad thing at all. I liked this a fair bit, but I'm not sure I'd have it again because I'm not convinced it's good for me. On the bright side, the whole carton is only 104 calories so it's a modest indulgence. I think I'd buy this again, but I don't tend to drink my sweets very often. I tend to prefer to eat them because I'm a texture junky. That being said, I think this might be a nice morning sweet drink with something blander alongside it (like a piece of toast). It'll also be a refreshing pick-me-up in the afternoon. Still, I can't see drinking it often because it is rather intensely sweet. 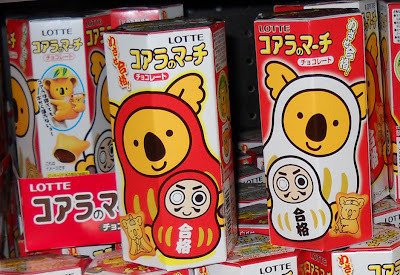 There are lots of weird cookies sold all over the world. I don't imagine that Japan has the market cornered on such things, but I do see more of them sold in Tokyo than I ever saw back home. In the U.S., usually weird things were so regional that you couldn't get them unless you went to some place which claimed to be "the capital of (food type)". For instance, I bet you can get cheese-flavored ice cream in Wisconsin or cajun cookies in New Orleans, but neither would be sold in shops in big cities. These red onion langue du chat (cat's tongue) cookies are from Hokkaido. It seems that everything odd that I find here is from Hokkaido. 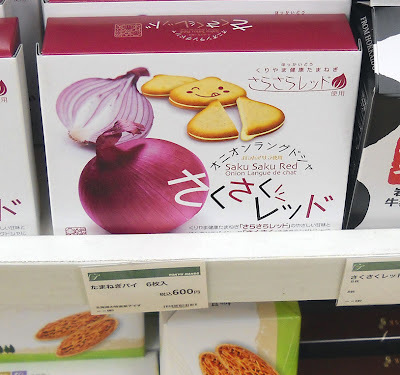 Though I thought at first that they might be just shaped like onions, my research seems to indicate they are savory cookies with spices that compliment onion flavor and have a cheese cream sandwiching them together. They are shown served with wine. I wasn't really tempted, not because they aren't interesting, but because I didn't feel like paying 600 yen ($9.14) for a box of 6 of something that I am not at all sure is going to be tasty. When I was a kid, I had the experience that so many children are familiar with in which my mother said I couldn't leave the table until I ate my vegetables. In my case, that vegetable was peas. I'm actually pretty open-minded about vegetables in general and will sample, if not eat and enjoy, nearly anything except peas. Oh sure, I'll eat a random pea in a dish full of other items, but I'd never seek out pea soup or buy peas and eat them straight up. My mother made sure that I would forever hate peas by making me sit there until I ate mushy, salty, disgusting canned peas. I don't remember if I gave in, but my distinct impression was that I won rather than my mother or the peas. In light of that, it is odd that I'd look upon this sleeve of pea-driven salted snacks and decide that, "yes, I will buy this." Trust me when I say that this is in no way some valiant effort to overcome my vegetable traumas from childhood but rather my careless consideration of the Japanese and addled confusion. I read "mame", but my brain "heard" "edamame" (immature soybeans). It also doesn't hurt that this has a picture of a yuzu fruit and the characters for yuzu pepper written on it. I'm a bit nutty for yuzu, as future and past reviews will reveal. These smell very "beany", which is no surprise since they are pea-based and the first ingredient is "endo powder" or pea powder. The flavor is comes in layers, and that is always a good thing. 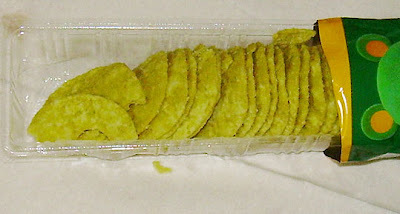 The chips are quite tiny and feel very cool on the tongue and you experience the pea flavor first. That is followed by the almost vinegary sourness of the yuzu and finally a slightly peppery kick. I love it when a pedestrian snack has depth of flavor as this does. So often, cheap snacks such as this about 90-yen ($1.17) 39-gram (1.4 oz.) sleeve, rely mainly on crunchiness, greasiness, and salt to make the consumer happy. This has quite a bit more going for it. I am very attracted in general to Bourbon's Petit line of snacks because of the size, portability and variety and this really is one of the better options for salted snacks that they have offered. The only issue I have with these is that they do have a distinct "Pringles" texture going for them as they are the sort of chip that is pressed together and then fried. It also is pretty fatty and packs 226 calories into this small amount. As long as you don't fool yourself into thinking that pea-based chips are more nutritious than potato ones though, you're going to be okay with that. This review marks a personal first for me; it is the first time I've gone into a store to buy something and found myself crying in the snack aisle. No, there hasn't been a marked increase in the price of chocolate (yet) nor did they take away some much-loved snack. If you read my other blog first, you may already know why. I stood in front of the shelf with rows of sleeved Bourbon petit snacks and saw the kinako wafers (which are heavenly) and thought about the fact that my days of being able to casually peruse and purchase such snacks are now greatly numbered. That's right, gentle readers, I'm leaving Japan. A deeper explanation is on my 1000 Things blog, but the bottom line is that my husband and I are going on March 29 and don't anticipate returning. Of course, "never say never" is a very good motto, but our plans are not to return. For my other blog, this doesn't mean much as memories are as good as being here in constructing those posts. For this blog, the future is quite a bit more difficult to predict as I peer into my Japan-related crystal ball. I'd like to continue sampling and writing about Japanese snacks, but I have no way of knowing at this time what the availability of such things will be upon my return. This is, in large part, because I'm not even sure where I'll be living beyond the state I ultimately plan to be in (California). 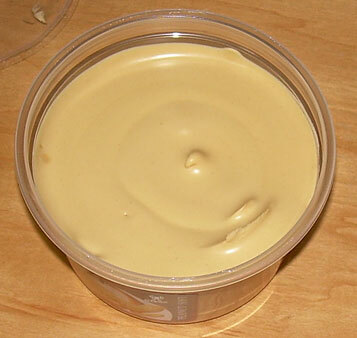 Awhile back, I negatively reviewed something called "Peanut Cream" by Sonton. 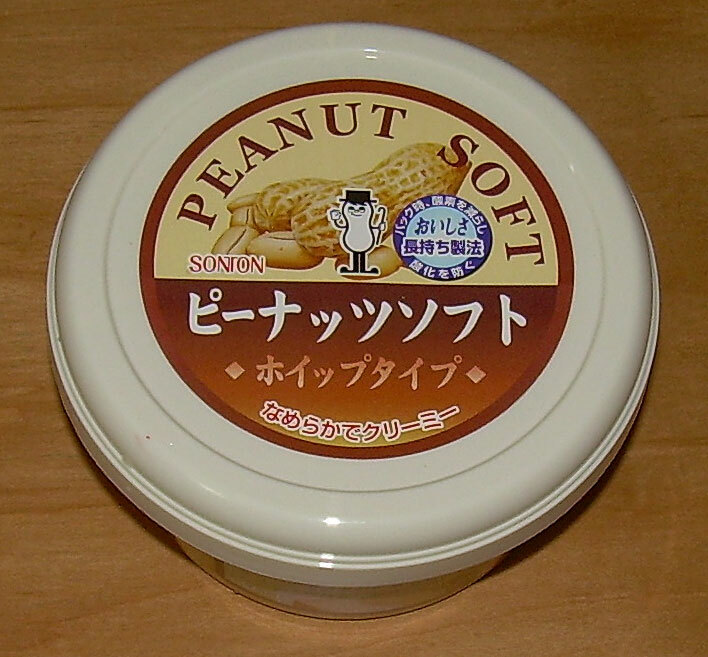 I wanted to give one of the Peanut Soft versions sold in many Japanese markets a try, but I wanted to try a different brand as one of the commenters mentioned that Sonton was the worst. Unfortunately, my local market only stocked this brand in peanut flavor so I paid my 268 yen ($3.52) and decided to take my chances. These tubs of softly whipped cream come in a variety of flavors and right next to this one was a peanut/kinako combo that I nearly bought instead of the straight up peanut variety. I decided that I'd rather go for something that my husband might be willing to eat as well because I've got two months left in Japan and 190 grams (6.7 oz.) of this is a bit much for one person to polish off in a short time, especially when each tablespoon is packing 95 calories. 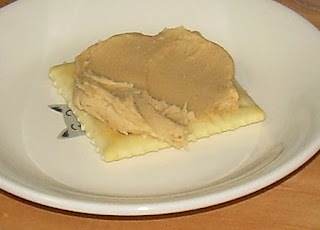 That makes it slightly more energy dense than peanut butter and the ingredients make it a lot less healthy. The primary components of this "peanut soft" are peanut butter, sugar, and shortening. This is junk food pure and simple. As for how it tastes... Well, it's heaven on a spoon. It's sweet, soft, light, and has a nice peanut flavor. It's like peanut butter that is actually "buttery". The fatty texture on the tongue is most gratifying and the sweetness just a nudge away from cloying. The good part about it is that you don't have to use a lot to be satisfied. The bad part is that it's so good that you may want to be gluttonous about it. This is a treat to be enjoyed in moderation, rather like Nutella in terms of how controlled you are about eating it, not so much in terms of flavor. Sometimes you can buy bread in bakeries in Japan that are spread with peanut cream and this is what they are spread with. I've had such bread given to me before and it is wickedly awesome. I don't buy it myself usually, but now I know that I can "make it" any time if I have a tub of this around. If you see it and want to indulge and throw caution about nutrition to the wind, I can't recommend this highly enough. Click to see a much larger version. My set includes yuzu koshoo sauce, cream-infused tofu, and red miso soup. Tonkatsu, or fried pork cutlet, is a staple in many Japanese restaurants. These cutlets are folded into many types of dishes including Japanese-style curry and even sandwiches. It is part of adapted Western cuisine, which makes many Japanese people believe that this is what we non-Japanese folks are eating day-in and day-out and making ourselves fat with. The truth is that I never ate anything like this back home, though that may reflect a general dislike of fried food. 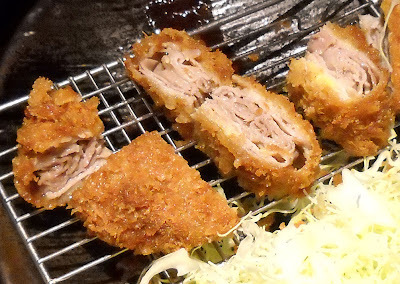 Tonkatsu varies wildly in quality and some of it can be downright abysmal. Most of it is a slab of pork (like a pork chop) coated in breading and deep fried. Genkatsu is a chain of shops which offers up very thinly sliced layers of domestic pork which are juicy and light (and probably really bad for you, but one has to live a little occasionally). They even have an English menu for tourists, though the awesome set lunch, with customized sauce, side dish, and miso soup type for around $15, isn't listed on it. 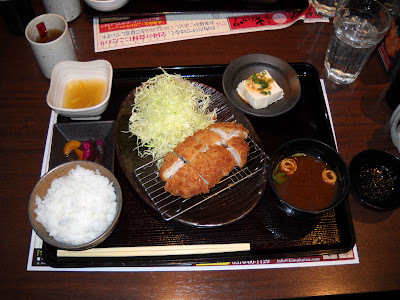 Tonkatsu is one of the most Western-friendly types of food in Japan with unique Japanese touches often offered on the side and generally bottomless bowls of rice, refills galore of oolong tea, and endless helpings of cabbage to boot. If you're coming here for a vacation, it's definitely worth a try.